Barn Owls have used the Old Willow Works for nesting for many years. 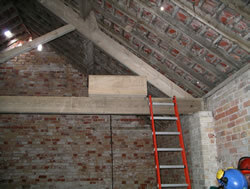 In recent years they have nested in a large, open box placed on the rafters, (image - left) gaining access through holes in the roof. 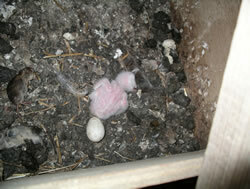 When the Parish Council took control of the building in 2005, the owls had a nest with a single chick (image - right). 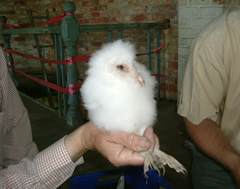 Although it fledged successfully, like many young Barn Owls, it died before the end of its first year. The cause of death was probably starvation. 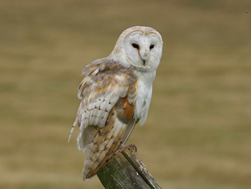 Barn Owls are specially protected by law and it is an offence to disturb them at the nest without a licence. Restoration of the building with an active nest would have resulted in the nest being deserted. Fortunately the restoration was able to be done over the first part of 2006 before the owls started nesting. The owls, however, still needed an undisturbed place to roost during the day. In order to give them this, we placed a large box in a tree near the Willow Works. 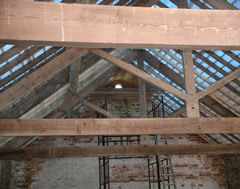 We agreed that we would make provision for the owls to nest in the restored building and the Environment Agency provided funds for the construction of two 'owl lofts', one at either end of the building. 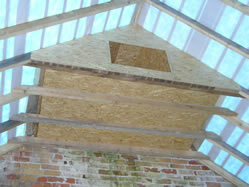 These lofts are sealed from the main building with access provided for the owls by enlarging the former ventilation slits in the gable ends of the buildings. Restoration was completed at the end of March and, amazingly, the owls took up residence immediately. 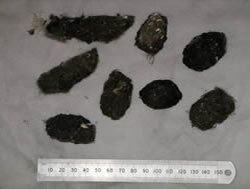 Inspection of the temporary box revealed several owl pellets, showing the birds had made use of their temporary quarters. Inspections of the nest, under licence, followed through the season. Three eggs hatched, the chicks were ringed and eventually fledged in the summer. Inspection of both boxes, subsequent to the fledging, showed that the owls abandoned the box used for nesting at the eastern end of the building and started using the box at the western end for roosting. Meanwhile, the Stock Doves, which had been nesting in the western end had, wisely, moved to the eastern end. This is a sensible move for the doves - owls are quite happy to include them in their diet. The owls' hunting ground is in the area which the RSPB is restoring to grazing meadow. Although the RSPB's efforts are aimed primarily at restoring habitat for breeding and wintering wading birds, the area should prove to be ideal habitat for the birds. The owls are being used to help monitor the local environment. 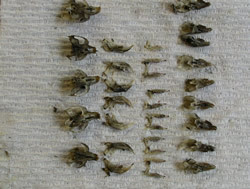 All owls regurgitate pellets. 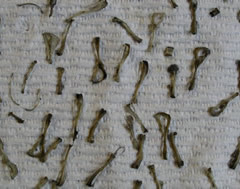 These are composed of the indigestible parts of their prey - mainly fur and bones. that, as time goes on, we can see how the owls' diet changes. This will, in turn, show how the small mammal population is changing. In addition to Barn Owls, there are Little Owls in the area. At least one individual has been using the restored Willow Works as a restaurant with a view, having gained access through a window. It left behind a large collection of its prey remains - the wings of peacock and tortoiseshell butterflies together with its own distinctive shape of pellet.